Article 19 of Regulation (EU) 2016/1628, provides for monitoring of the gaseous pollutant emissions by testing in-service engines installed in non-road mobile machinery and operated over their normal operating duty cycles. In order to ensure the monitoring provided for in Article 19, it is necessary to adopt detailed arrangements with regard to the selection of engines, test procedures and reporting of results. In order to reduce the administrative burden for small volume manufacturers and for manufacturers producing a limited number of engine types or engine families, it is necessary to limit the number of engines subject to in-service monitoring testing by those manufacturers. To ensure coherence in the application of this Regulation, the manufacturer should not be required to present in-service monitoring test results if it can demonstrate that the engines have not been installed in non-road mobile machinery or that it was not able to obtain access to an engine in any application for testing. This Regulation establishes detailed arrangements with regard to the selection of engines, test procedures and reporting of results relating to monitoring of gaseous pollutant emissions from in-service internal combustion engines installed in non-road mobile machinery using portable emission measurement systems. 2. This Regulation applies to engine manufacturer. This Regulation does not apply to original equipment manufacturer. 3. This Regulation does not apply where the manufacturer demonstrates to the approval authority that it is not able to obtain access to any engine installed in a non-road mobile machinery for the purposes of in-service monitoring. Gaseous pollutant emissions from in-service engines referred to in Article 19(1) of Regulation (EU) 2016/1628 shall be monitored in accordance with the Annex to this Regulation. (1) OJ L 252, 16.9.2016, p. 53. 1.2. The manufacturer shall obtain access to engines installed in non-road mobile machinery in order to conduct in-service monitoring tests. When conducting the in-service monitoring test the manufacturer shall perform the emissions data sampling, measurement of exhaust parameters and data logging of an in-service engine installed in a non-road mobile machinery operated over its normal operating duty cycles until reaching the minimum test duration as set out in point 2 of Appendix 2.
be in conformity with the EU type-approval documents with regard to the components of the emission control system(s) installed in the engine and in the non-road mobile machinery. engines with an ECU with missing data or a data protocol that does not enable clear identification and validation of the necessary signals. 1.5. Engines where the collection of ECU data influences the non-road mobile machinery gaseous pollutant emissions or performance shall be considered as non-eligible for in-service monitoring test. Notwithstanding the requirements of article 39 of Regulation (EU) 2016/1628, an alternative engine shall only be selected if the manufacturer can substantially prove to the approval authority the absence of any defeat strategy. 2.1. The manufacturer shall submit to the approval authority that has granted approval of an engine type or, where applicable, engine family, within 1 month of the start of production of the approved engine type or engine family, the initial plan for monitoring in-service engines. 2.3. Manufacturers shall submit to the approval authority an updated plan for monitoring in-service engines whenever the list of particular engine(s) and non-road mobile machinery selected is completed or revised. The updated plan shall be include a justification of the criteria used for the selection and the reasons for revising the previous list, if applicable. 2.4. The approval authority shall approve the initial and subsequently updated plan(s) or request the appropriate amendments within 2 months of their submission, and shall ensure that the final plan includes the widest variety of engine types and categories of non-road mobile machinery. 2.5. Each initial or subsequently updated monitoring plan shall be approved by the approval authority before the testing of engines and non-road mobile machinery identified therein is started. 2.6.1.1. Testing 9 engines with an accumulated service of less than 30 % of the EDP. Test results shall be submitted to the approval authority by 31 December 2022. 2.6.1.2. Testing 9 engines with an accumulated service higher than 70 % of the EDP. Test reports shall be submitted to the approval authority by 31 December 2024. 2.6.1.3. When the manufacturer cannot fulfil the requirement under point 2.6.1 due to an unavailability of engines with the required service accumulation, the approval authority shall not reject a change to the testing scheme based on a 4 years' period set out in point 2.6.2. Engines already tested in accordance with point 2.6.1 shall remain valid under point 2.6.2. Testing nine engines per year during 4 consecutive years. Test reports shall be submitted to the approval authority every year. 2.6.2.1. The test results of the first nine engines shall be submitted 12 months after the first engine was installed in a non-road mobile machinery and not later than 18 months after starting the production of the approved engine type or engine family. 2.6.2.2. When the manufacturer demonstrates to the approval authority that no engine has been installed in a non-road mobile machinery 18 months after starting the production, the test results shall be submitted after the installation of the first engine, on a date agreed with the approval authority. manufactures producing less than 125 engines per year of one single engine family shall submit one engine's test results per year. The approval authority shall verify the declared production quantities. 2.6.3. The manufacturer may conduct more tests than those established by the testing schemes set out in points 2.6.1 and 2.6.2. 2.6.4. 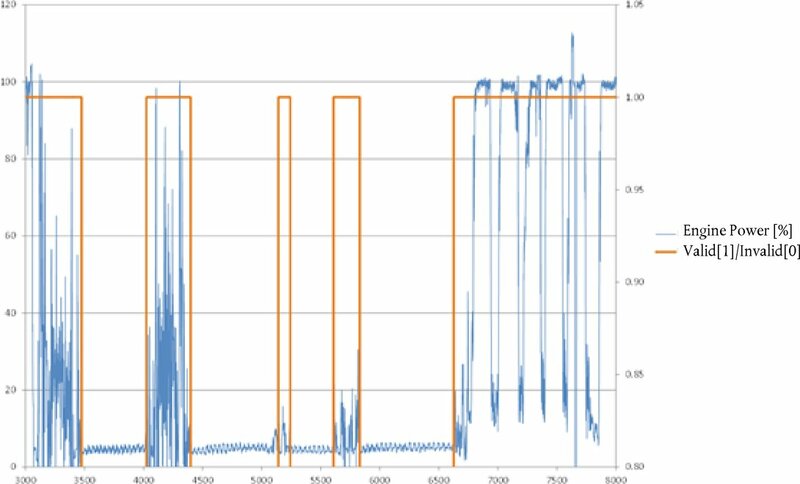 Multiple testing of the same engine to provide data for the consecutive service accumulation stages in accordance with points 2.6.1 and 2.6.2 is allowed but not mandatory. The in-service monitoring test shall reflect the engine's performance when installed in a non-road mobile machinery, in actual operation and operated by its usual professional operator. 3.1.1. The non-road mobile machinery's operator performing the in-service monitoring test may be other than the usual professional one if the operator demonstrates enough skills and training to the approval authority. 3.1.2. The manufacturer shall provide detailed explanations to the approval authority on the usual operator's skills and training, and demonstrate that the selected operator is adequate for the in-service monitoring test. 3.2.1. The test shall be performed during the complete (or partial) non-road mobile machinery's actual operation. 3.2.2. When the manufacturer demonstrates to the approval authority that it is not possible to comply with point 3.2.1, the test duty cycle shall represent, as far as possible, the non-road mobile machinery's actual operation. 3.2.2.1. The representative test duty cycle shall be determined by the manufacturer in agreement with the approval authority. comprise of sufficient load activity to achieve the minimum test duration set out in point 2 of Appendix 2.
pb is the atmospheric pressure, kPa. The lubricating oil, fuel and reagent (for exhaust after-treatment systems that use a reagent to reduce gaseous pollutant emissions) shall comply with the specifications issued by the manufacturer. 3.4.1. The fuel shall be market fuel or reference fuel as specified in Annex V to Delegated Regulation (EU) 2017/654. 3.4.2. To demonstrate compliance with point 3.4, the manufacturer shall take samples and retain them for a period of 12 months, or less if agreed by the approval authority. 3.4.3. Reagent samples shall not be frozen. Operating sequence is the elapsed time of uninterrupted non-road mobile machinery operation and continuous data sampling during an in-service monitoring test. The in-service monitoring test shall be conducted in one single operating sequence, except under the combined data sampling method set out in point 4.2, where several operating sequences are combined in a single in-service monitoring test. Continuous data sampling shall be used when one single operating sequence is equal or more than the minimum test duration set out in point 2 of Appendix 2. 4.1.1. A maximum of 3 minutes of data may be excluded due to one or several episodes of temporary signal loss. As alternative to point 4.1, the data sampling may be obtained from combining the results of several operating sequences. 4.2.1. 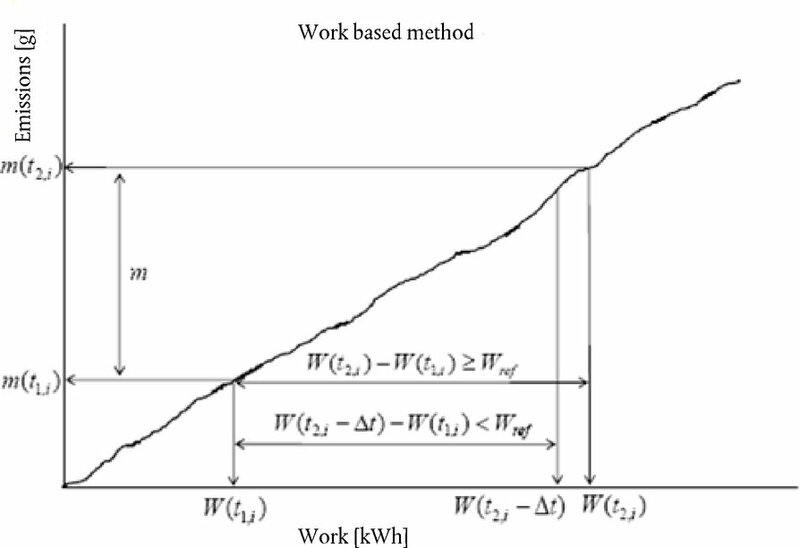 Combined data sampling shall be used only when the test conditions do not enable reaching the minimum test duration set out in point 2 of Appendix 2 with one single operating sequence despite attempting to achieve this, or when the category(ies) of non-road mobile machinery selected for testing is employed in multiple working activities with different relevant duty cycle(s). combined data sampling shall not be used if an engine malfunction occurs, as set out in point 8 of Appendix 2. 5.1. The ECU shall provide data stream information to the measurement instruments or data logger of the PEMS in accordance with the requirements set out in Appendix 7. 5.2.1. The conformity of all the signals provided by the ECU in accordance with Table 1 of Appendix 7 shall be verified by the approval authority and shall meet the requirements set out in point 5 of Annex VI to Commission Delegated Regulation (EU) 2017/654 (1). 5.2.2 Manufacturers shall check in accordance with the method set out in Appendix 6 the conformity of the ECU torque signal during the in-service monitoring of engines installed on non-road mobile machinery using a PEMS. 6.1. In-service monitoring tests shall be conducted using Portable Emissions Measurement System (PEMS) in accordance with Appendix 1. 6.2. Manufacturers shall comply with the test procedure set out in Appendix 2 with regard to the in-service monitoring of engines installed on on-non-road mobile machinery using a PEMS. 6.3. Manufacturers shall follow the procedures set out in Appendix 3 for the pre-processing of the data resulting of the in-service monitoring of engines installed on on-non-road mobile machinery using a PEMS. 6.4. Manufacturers shall follow the procedures set out in Appendix 4 for the determination of valid events during an in-service monitoring test of engines installed on on-non-road mobile machinery using a PEMS. No data shall be modified or removed from a test. The entire data sampling shall be retained at least for 10 years by the manufacturer and made available upon request to the approval authority and the Commission. Manufacturers shall follow the procedures set out in Appendix 5 for the gaseous pollutant emissions calculations for the in-service monitoring of engines installed on on-non-road mobile machinery using a PEMS. 9.1. Approval authorities may conduct a confirmatory in-service monitoring test in order to have an independent in-service monitoring measurement. 9.2. The confirmatory test shall be performed on the engine family/type and category(ies) of non-road mobile machinery specified in point 2; a particular engine fitted in a relevant non-road mobile machinery shall be tested according to the requirements set out in this Regulation. 10.1. Approval authorities shall draft a test report of the in-service monitoring of engines installed on on-non-road mobile machinery using a PEMS for each engine tested. The test report shall show the activities and results of the in-service monitoring and include at least the information required by data entries 1 to 11 of Appendix 8. 10.2.1. Instantaneous measured data and instantaneous calculated data shall not be included in the test report but shall be kept by the manufacturer and made available upon request to the European Commission and the approval authority for the period set out in point 7. 10.2.2. Instantaneous measured data and instantaneous calculated data shall include at least the information required by data entries I-1 to I-2.20 of Appendix 8. For the purposes of Article 44(3)(b) of Regulation (EU) 2016/1628, the manufacturer shall provide a separate report containing the information required by the following data entries of Appendix 8: 1.1, 2.2, 2.4, 3.2, 6.3, 6.4.1, 6.10 Section 9 and Section 10. Information for data entry 6.3 shall be provided at regional level, providing approximate geographic location only. (1) Commission Delegated Regulation (EU) 2017/654 of 19 December 2016 supplementing Regulation (EU) 2016/1628 of the European Parliament and of the Council with regard to technical and general requirements relating to emission limits and type-approval for internal combustion engines for non-road mobile machinery (see page 1 of this Official Journal). PEMS may include a Global Positioning System (GPS). the response and updating-recording verification of the gas analyser as set out in Section 8.1.6 of Annex VI to Delegated Regulation (EU) 2017/654. 2.1.2. Measurement instruments shall meet the specifications set out in Section 9.4 of Annex VI to Delegated Regulation (EU) 2017/654. 2.1.3. The analytical gases used for calibrating the measurement instruments shall meet the requirements set out in Section 9.5.1 of Annex VI to Delegated Regulation (EU) 2017/654. 2.2.1. The transfer line shall meet the requirements set out in point 9.3.1.2 of Annex VI to Delegated Regulation (EU) 2017/654. 2.2.2. The sampling probe shall meet the requirements set out in point 9.3.1.1 of Annex VI to Delegated Regulation (EU) 2017/654. The gaseous pollutant emissions to be measured and recorded during the in-service monitoring test are: carbon monoxide (CO), total hydrocarbons (HC) and nitrogen oxides (NOx). Additionally, carbon dioxide (CO2) shall be measured to enable the calculation procedures described in Appendix 5. The test duration, comprising all operating sequences and only including valid data, shall be long enough to complete between five and seven times the work performed during the NRTC or to produce between five and seven times the CO2 reference mass in kg/cycle from the NRTC. demonstration of the availability of the ECU data stream information, according to the requirements set out in point 2 of Appendix 7. 4.1. The installation of the PEMS shall not influence the non-road mobile machinery gaseous pollutant emissions or performance. In any case, the installation shall comply with the locally applicable safety regulations and insurance requirements and shall follow the instructions issued by the PEMS, measurement instruments, transfer line and sampling probe manufacturer. The electrical power supply of the PEMS shall, be provided by an external power supply unit. 4.2.1. When the manufacturer demonstrates to the approval authority that it is not possible to comply with point 4.2, a source drawing its energy (directly or indirectly) from the engine during the test may be used. 4.2.2. In this case, the peak power consumption of the PEMS shall not exceed 1 % of the engine maximum power, and additional measures shall be taken to prevent the excessive discharge of the battery when the engine is not running or idling. ambient hydrocarbons — if using a FID analyser that uses ambient air as FID burner air. The installation of the EFM shall not increase the backpressure beyond the value recommended by the manufacturer. 4.4.1. The EFM shall be attached to the non-road mobile machinery's tailpipe. The EFM's sensors should be placed between two pieces of straight tube whose length should be at least 2 times the EFM diameter (upstream and downstream). 4.4.2. The EFM shall be placed after the non-road mobile machinery silencer, to limit the effect of exhaust gas pulsations upon the measurement signals. The transfer line shall be properly insulated at the connection points (sampling probe and back of the measurement instruments). 4.5.1. If the length of the transfer line is changed, the transport times shall be verified and if necessary corrected. 4.5.2. The transfer line and the sampling probe shall be installed in accordance with the requirements set out in Section 9.3 of Annex VI to Delegated Regulation (EU) 2017/654. The data logger shall be connected with the engine ECU to record the engine parameters listed in Table 1 of Appendix 7, and, where applicable, the engine parameters listed in Table 2 of Appendix 7. The antenna should be mounted at the highest possible location, without risking interference with any obstructions encountered during in-use operation. The ambient temperature shall be measured at the beginning of the test and also at the end of the test within a reasonable distance from the non-road mobile machinery. It is allowed to use the CAN signal for intake air temperature (temperature experienced by the engine). If an intake air temperature sensor is used to estimate the ambient temperature the recorded ambient temperature shall be the intake air temperature adjusted by the applicable nominal offset between ambient and intake air temperature as specified by the manufacturer. The measurement instruments shall be warmed up and stabilised until pressures, temperatures and flows have reached their operating set points, according to the instructions issued by the measurement instrument/PEMS manufacturer. To prevent system contamination, the transfer line shall be purged until sampling begins, according to the instructions issued by the transfer line/PEMS manufacturer. The transfer line shall be heated to 190 °C (+/– 10 °C) before starting the test to avoid the presence of cold spots that could lead to a contamination of the sample by condensed hydrocarbons. The zero and span calibration and the linearity checks of the gas analysers shall be performed using the analytical gases set out in point 2.1.3 of Appendix 1. The EFM shall be purged at the pressure transducer connections in accordance with the instructions issued by the PEMS or EFM manufacturer. This procedure shall remove condensation and diesel particulate matter from the pressure lines and the associated flow tube pressure measurement ports. Gaseous pollutant emissions data sampling, measurement of the exhaust parameters and recording of the engine and ambient data shall start prior to starting the engine. Gaseous pollutant emissions data sampling, measurement of the exhaust parameters and recording of the engine and ambient data shall continue throughout the normal in-use operation of the engine. The engine may be stopped and started, but the gaseous pollutant emissions data sampling, measurement of the exhaust parameters and recording of the engine and ambient data shall continue throughout the entire in-service monitoring test. At the end of the in-service monitoring test, sufficient time shall be given to the measurement instruments and data logger to allow their response times to elapse. The engine may be shut down before or after data logging is stopped. The valid measured data for the gaseous pollutant emissions calculations shall be determined in accordance with Appendix 4. Point 6.4.2 shall apply to those calculations. 6.4.1. In order to determine the duration of the take-off phase after a long non-working event, as set out in point 2.2.2 of Appendix 4, the exhaust gas temperature shall be measured during the operating sequence within 30 cm of the outlet of the after-treatment device used for NOx reduction. Cold start gaseous pollutant emissions measured data shall be removed for the gaseous pollutant emissions calculations. Valid measured data for gaseous pollutant emissions calculations shall start after the engine coolant temperature has reached 343 K (70 °C) for the first time or after the engine coolant temperature is stabilised within +/– 2 K over a period of 5 minutes, whichever comes first; in any case it shall start no later than 20 minutes after starting the engine. Zero verification of the gas analysers shall be conducted at least every 2 hours during an in-service monitoring test. The results obtained with the checks performed in accordance with point 7.1 may be used to perform a zero drift correction. The drift verification shall be performed only if no zero drift correction was made during the in-service monitoring test in accordance with point 7.2. 7.3.1. No later than 30 minutes after the in-service monitoring test is completed, the gas analysers shall be zeroed and spanned in order to verify their drift compared to the pre-test results. 7.3.2. The zero, span and linearity checks of the gas analysers shall be performed as set out in point 5.4. 8.1. In the case that a malfunction occurs during an operating sequence and the non-road mobile machinery operator is clearly notified by the on-board diagnostics system via a malfunction visual warning, text message or other indicator, the in-service monitoring test shall be considered void. 8.2. Any malfunction shall be corrected before any further in-service monitoring test is carried out on the engine. (1) Measured or corrected to a wet basis. the exhaust system installed in the non-road mobile machinery diverts a portion of the exhaust to another part of the non-road mobile machinery (e.g. for heating) upstream of the location where an EFM could be installed. In these cases, where the manufacturer is able to provide robust evidence to the approval authority of the correlation between the fuel mass flow estimated by the ECU and the fuel mass flow measured on the engine dynamometer test bench, the EFM may be omitted and indirect exhaust flow measurements (from fuel and intake air flows or fuel flow and carbon balance) may be applied. (3) Use the ambient temperature sensor or an intake air temperature sensor. Use of an intake air temperature sensor shall comply with the requirements set out in the second paragraph of point 5.1. (4) The recorded value shall be either (a) the net torque; or (b) the net torque calculated from the actual engine percent torque, the friction torque and the reference torque, according to standards set out in point 2.1.1 of Appendix 7. The basis for the net torque shall be uncorrected net torque delivered by the engine inclusive of the equipment and auxiliaries to be included for an emissions test in accordance with Appendix 2 of Annex VI to Delegated Regulation (EU) 2017/654. ‘span response’ means the mean response, including noise, to a span gas during a time interval of at least 30 seconds. if the difference between the pre-test and post-test results is equal to or greater than two per cent, the measured concentrations shall be drift corrected according to point 2.2. If no correction is made, the test shall be considered void. The drift corrected concentration value shall be calculated in accordance with the requirements set out in Section 2.1 or Section 3.5 of Annex VII to Delegated Regulation (EU) 2017/654. The difference between the uncorrected and the corrected brake-specific gaseous pollutant emission values shall be within ± six per cent of the uncorrected brake-specific gaseous pollutant emission values. If the drift is greater than six per cent, the test shall be considered void. If drift correction is applied, only the drift-corrected gaseous pollutant emission results shall be used when reporting gaseous pollutant emissions. To minimise the biasing effect of the time lag between the different signals on the calculations of the mass of the gaseous pollutant emissions, the data relevant for gaseous pollutant emissions calculations shall be time aligned, in accordance with the requirements set out in points 3.1 to 3.4. The data from the gas analysers shall be properly aligned in accordance with the requirements set out in Section 8.1.5.3 of Annex VII to Delegated Regulation (EU) 2017/654. The data from the gas analysers shall be properly aligned with the data of the EFM using the procedure set out in point 3.4. The data from the PEMS (gas analysers and EFM) shall be properly aligned with the data from the engine ECU using the procedure in point 3.4. Category 3: Engine (Torque, speed, temperatures, fuel rate from ECU). Category 2 with Category 3: the CO2 concentration and the engine fuel flow. The consistency of the data (exhaust mass flow measured by the EFM and gas concentrations) shall be verified using a correlation between the measured engine fuel flow from the ECU and the engine fuel flow calculated in accordance with the procedure set out in Section 2.1.6.4 of Annex VII to Delegated Regulation (EU) 2017/654. b is the y intercept of the regression line. The consistency of the ECU torque data shall be verified by comparing the maximum ECU torque values at different (if appropriate) engine speeds with the corresponding values on the official engine full load torque curve and in accordance with Appendix 6.
the work calculated using the data from the ECU (Engine torque and engine speed). The ambient pressure value shall be checked against the altitude indicated by the GPS data, if available. 4.5. The approval authority may consider the test void if it is not satisfied with the results of the data consistency check. If the concentration is measured on a dry basis, it shall be converted to a wet basis in accordance with the procedure set out in Section 2 or Section 3 of Annex VII to Delegated Regulation (EU) 2017/654. The NOx concentrations measured by the gas analysers shall not be corrected for ambient air temperature and humidity. 1.2. The methodology set out in this Appendix is based on the concept of working and non-working events. 1.3. Any event considered as a non-working event in accordance with this Appendix shall not be considered as valid for the calculations of the work or CO2 mass and the gaseous pollutant emissions and conformity factors of the averaging windows set out in Section 2 of Appendix 5. Only working events shall be used for the purpose of calculations. 1.4. Non-working events shall be categorised as short non-working events (≤ D2) and long non-working events (> D2) (see the Table for the value of D2). Events where the engine power is below 10 % of the engine maximum net power. Events corresponding to engine system cold conditions (cold start) set out in point 6.4.2 of Appendix 2. Events logged under ambient conditions not fulfilling the requirements set out in point 3.3 of this Appendix. Events logged during the periodic checks of the measurement instruments. Non-working events shorter than D0 shall be considered as working events and merged with the surrounding working events (see the Table for the values of D0). The take-off phase following long non-working events (> D2) shall also be considered as a non-working event until the exhaust gas temperature reaches 523 K. If the exhaust gas temperature does not reach 523 K within D3 minutes, all events after D3 shall be considered as working events (see the Table for the values of D3). For all non-working events, the first D1 minutes of the event shall be considered as working event (see the Table for the values of D1). Detect and split into working events and non-working events. 3.1.1. Define the working events and non-working events in accordance with point 2. 3.1.2. Calculate the duration of non-working events. 3.1.3. Mark the non-working events shorter than D0 as working events (see the Table for the values of D0). 3.1.4. Calculate the duration of the remaining non-working events. Merge short working events (≤ D0) into non-working events. 3.2.1. Merge working events shorter than D0 with the surrounding non-working events of duration longer than D1. Exclude working events after long non-working events (take off phase). 3.3.1. Consider as non-working events those events after long (> D2) non-working events until the exhaust gas temperature reaches 523 K or until D3 minutes have elapsed (see the Table for the values of D3), whatever happens first. Include non-working events after working events. 3.4.1. Include D1 minutes of non-working event at the end of any working event (see the Table for the values of D1). The instantaneous mass of the gaseous pollutant emissions shall be calculated on the basis of the instantaneous concentration of the gaseous pollutant emissions measured during the in-service monitoring test and in accordance with the procedure set out in Section 2 or Section 3 of Annex VII to Delegated Regulation (EU) 2017/654. Averaging window is the sub-set of the complete calculated data set during the in-service monitoring test whose CO2 mass or work is equal to the engine CO2 mass or work measured over the reference laboratory NRTC. The mass of the gaseous pollutant emissions and the conformity factors shall be calculated using the moving averaging window method, based on the reference work (procedure set out point 2.2) and the reference CO2 mass (procedure set out in point 2.3) measured over the reference laboratory NRTC. 2.1.1. Any data excluded, under the terms of Appendix 4, shall not be considered for the calculations of the work or CO2 mass and the gaseous pollutant emissions and conformity factors of the averaging windows. 2.1.2. The moving averaging window calculations shall be conducted with a time increment Δt equal to the data sampling period. 2.1.3. 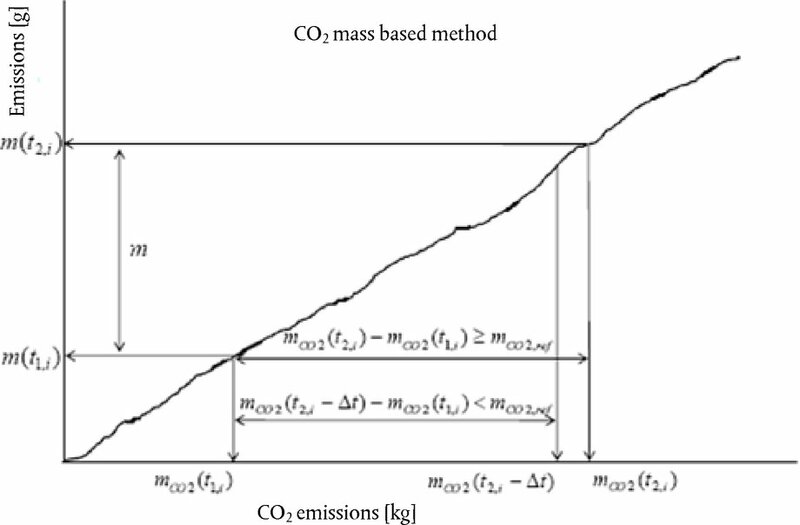 The mass of the gaseous pollutant emissions for each averaging window (mg/averaging window) shall be obtained by integrating the mass of the instantaneous gaseous pollutant emissions in the averaging window. 2.1.4. The calculations shall be conducted and presented for both procedures: the reference CO2 mass and the reference work. Where Δt is the data sampling period, equal to 1 second or less. The valid averaging windows are the averaging windows whose average power exceeds the power threshold of 20 % of the maximum engine power. The percentage of valid averaging windows shall be equal or greater than 50 %. 2.2.2.1. The test shall be considered void if the percentage of valid averaging windows is less than 50 %. L is the applicable limit, g/kWh. 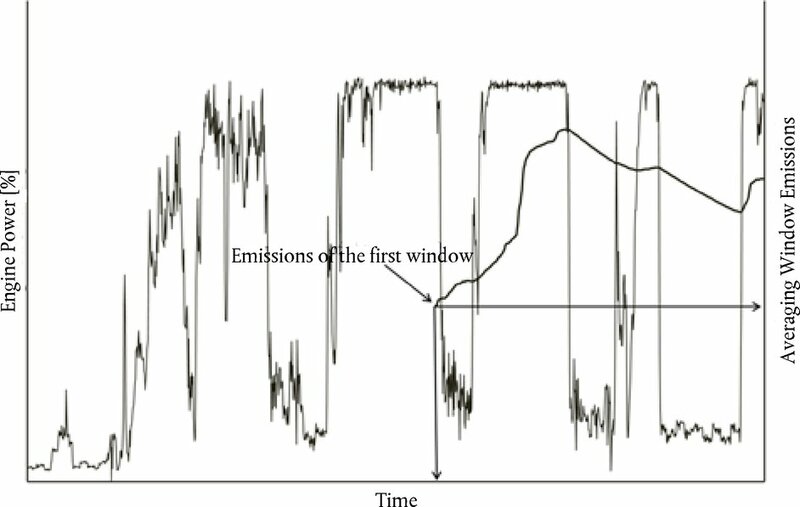 The CO2 masses are calculated in the averaging windows by integrating the instantaneous gaseous pollutant emissions calculated according to the requirements introduced in point 1. Pmax is the maximum engine power, kW. The percentage of valid averaging windows shall be equal or greater than 50 per cent. mL is the mass emission of gaseous pollutant corresponding to the applicable limit on the NRTC, mg. In accordance with Standard ASTM E 29-06b (Standard Practice for Using Significant Digits in Test Data to Determine Conformance with Specifications), the final test results shall be rounded in one step to the number of places to the right of the decimal point indicated by the applicable emission standard plus one additional significant figure. No rounding of intermediate values leading to the final brake-specific gaseous pollutant emission result shall be allowed. the distribution of the conformity factors for all windows, calculated in accordance with points 2.2.3 and 2.3.2 without the determination of the valid data in accordance with Appendix 4 and without the determination of the valid windows set out in points 2.2.2 and 2.3.1 (minimum, maximum and 90th cumulative percentile). 1.1. The maximum torque method consists on confirming that a point on the reference maximum torque curve as a function of the engine speed has been reached during the in-service monitoring test. 1.2. If a point on the reference maximum torque curve as a function of the engine speed has not been reached during the in-service monitoring test, the manufacturer is entitled to modify the load activity of the non-road mobile machinery and/or the minimum test duration set out in point 2 of Appendix 2 as necessary in order to perform that demonstration after the in-service monitoring test. 1.3. The requirements set out in point 1.2 shall not be applied in the case that, in the opinion of the manufacturer and prior agreement of the type approval authority, it is not possible to reach a point on the maximum torque curve under normal operation without overloading the engine installed in the non-road mobile machinery, or to do so would not be safe. 1.4. In this case, the manufacturer shall propose to the approval authority an alternative method for checking the signal. The alternative method shall be employed only if the approval authority considers it feasible and applicable without overloading the engine or any safety risk. 1.5. 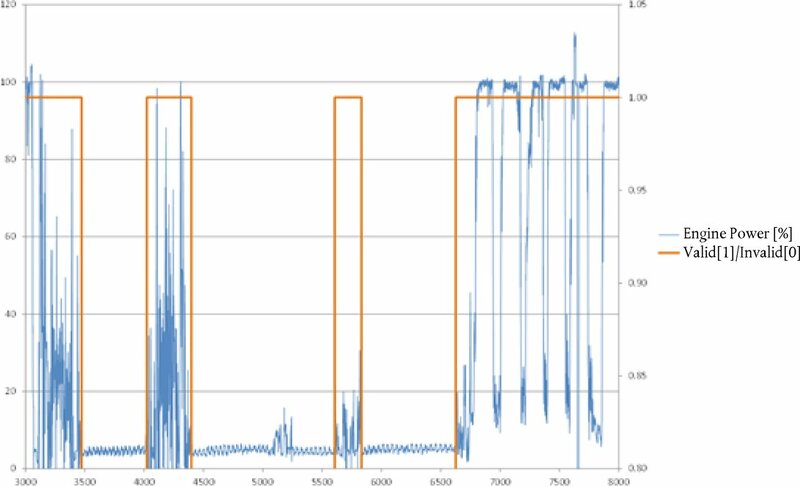 The manufacturer may propose to the approval authority, a more accurate and complete method for checking the conformity of the ECU torque signal during the in-service monitoring test than the method set out in points 1.1 to 1.4. In that case, the method proposed by the manufacturer shall be used instead of the method set out in those points. When the manufacturer demonstrates to the approval authority that it is not possible to check the ECU torque signal during the in-service monitoring test, the verification performed during the tests required for EU type-approval and stated in the EU type-approval certificate shall be accepted by the approval authority. 1.1. The ECU shall provide at a minimum the measurement data listed in the Table 1. 1.2. Where either ambient pressure or ambient temperature are not measured by external sensors, they shall be provided by the ECU according to Table 2. 1.3. Where exhaust mass flow is not measured directly, the engine fuel flow shall be provided according to the Table of point 1 of Appendix 2. 2.1.2. The ECU shall support the corresponding services of at least one of the standards listed above in order to provide the data set out in Table 1. Implementation of additional features of the standard(s) in the ECU is permitted but not mandatory. 2.1.3. Access to data stream information shall be possible by means of a wired connection (external scan-tool). 2.2.1. The communication speed on the wired data link shall be either 250 kbps or 500 kbps. 2.2.2. The connection interface between the engine and the measurement instruments of the PEMS shall be standardised and shall meet all requirements of ISO 15031-3 Type A (12 VDC power supply), Type B (24 VDC power supply) or SAE J1939-13 (12 or 24 VDC power supply). The manufacturer shall indicate in the information document set out in Implementing Regulation (EU) 2017/656 (3) on administrative requirements the communication standard(s) used for providing access to data stream information in accordance with point 2.1.1. (1) The provided value shall be either (a) the net brake engine torque; or (b) the net brake engine torque calculated from other appropriate torque values as defined in the corresponding protocol standard set out in point 2.1.1. The basis for the net torque shall be uncorrected net torque delivered by the engine inclusive of the equipment and auxiliaries to be included for an emissions test in accordance with Appendix 2 of Annex VI to Delegated Regulation (EU) 2017/654. (2) Use of an intake air temperature sensor shall comply with the requirements set out in the second paragraph of point 5.1 of Appendix 2. (3) Commission Implementing Regulation (EU) 2017/656 of 19 December 2016 laying down the administrative requirements relating to emission limits and type-approval of internal combustion engines for non-road mobile machinery in accordance with Regulation (EU) 2016/1628 of the European Parliament and of the Council (see page 364 of this Official Journal). (1) Averaging window is the sub-set of the complete calculated data set during the in-service monitoring test whose CO2 mass or work is equal to the engine CO2 mass or work measured over the reference laboratory Non-Road Transient Cycle (NRTC).